3 - Winners Holiday Contest and Sweeps along with a terrific group of fellow blogs have teamed up with The Popcorn Factory to bring you "The Popcorn Factory Deluxe Children's Easter Basket Giveaway. Three lucky readers that reside in the Continental United States and that are 18+ years of age will have the chance to win one of these great Baskets for their Children on Easter Morning. Each Basket will contain a assortment of mouth watering snacks like only The Popcorn Factory can provide. Their new Deluxe Basket, designed specifically for kids, offers a medley of popcorn and Easter treats. 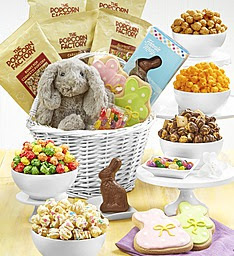 The reusable wicker basket comes filled with super soft, plush Gray Bunny, a Fannie May® Milk Chocolate Bunny, Pink & Green Bunny Polka Dot Cookies, Easter Pectin Jelly Beans and 5 flavors of popcorn: Cheese, Caramel, S’mores, Bunny Popcorn Cornfetti and Jelly Bean Cornfetti. I know it says children but most adults would love to sink their teeth in these goodies too. Holiday Contest and Sweeps received samples of the products shown for review purposes, no other compensation was received. The sponsors shown will be responsible for awarding and shipping the prize directly to the winner.The Popcorn Factory will be totally responsible for the awarding and shipping of the prize directly to the winner.